I heard a story once about a man and his son who had just come home from the funeral of their wife/mother. Clearly devastated they silently made their way through dinner and went to bed, not sure of what else to do. The young boy laid in the dark room staring at the ceiling listening to the utter silence around him. Eventually he couldn't bear it any longer and went to his dad's room and said-daddy it's so dark in my room, can I come in your bed please? The dad quietly obliged and welcomed his son. However, as the son continued to lay in his dad's arms he realized it was just as dark in that room as it was his own. Finally he wept in his dad's arms and said-daddy it's so dark, can you just tell me if your face is towards me or away from me? We've all felt that utter darkness in the storm where we just need to know, really know, that our Father is looking our way and closer than our next breath. Collective sigh. It's the truth though. I look back on the hard times in my life and realize I spent more time saying "why God?" instead of "help me be a faster learner God". 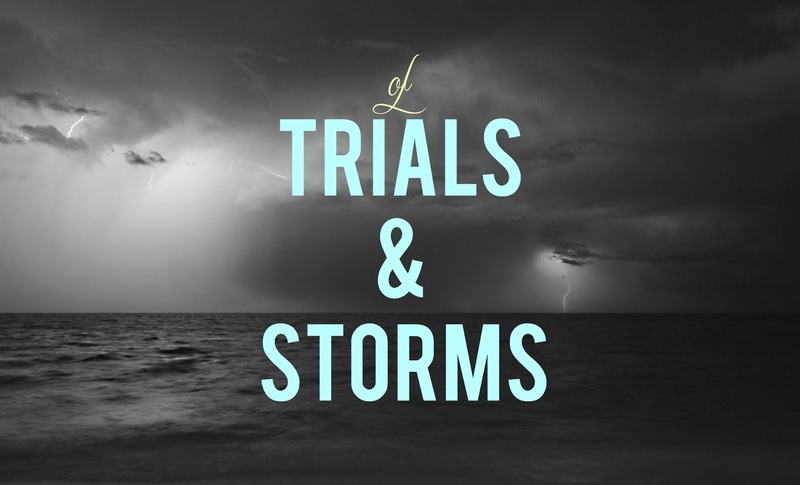 These trials are with great purpose and not haphazard or random in the least. My God loves me too much to let me go through life as I am, so if I didn't learn the lesson the hard way the first time, you bet I can see that one come back around. With Jesus trials will always pass. Even if they don't pass while still on this earth, we know they can't carry with us into eternity. Maybe it's just me, but I find comfort in those dark moments that this won't be forever. We have access to the ultimate TRUTH. Does that blow your mind like it does mine? I have somewhere to go that is bigger than anything I can wrap my mind around and is never like the search results on Google. I don't have to doubt it, question it, or research it to verify it's legitimacy. In the midst of a trial I know where I better saturate my mind in the Truth of God's Word. When the God of the universe promises to NEVER leave you, that changes things. We have a God who promises to never waver in His promises towards us for a second. Who will not grow weary, get tired, exhaust Himself of options, or get tired of carrying you if the trial lasts "too long". That is something, He is someone, we can throw all of our dependance and trust in any trial. Don't go it alone. We really are better together, that's why He instructed us to keep meeting together. He knew how hard life would get and the benefit, encouragement, and comfort we would get from doing it together as the Body of Christ. Remember when Jesus told us: "I have told you these things, so that in me you may have peace. In this world you will have trouble. But take heart! I have overcome the world." (John 16:33) Trials and storms are going to happen. It's not if, it's when. But for those in Christ it's going to be good. I've read the last page of the story and everything is restored, redeemed, and we win. However, we aren't on the last page yet. So what do we do? We look towards Calvary. Where a rugged cross reminds us that our worst storm was when we were lost, without hope, and hell bound because we had a debt we couldn't pay. But on that cross Jesus took care of the greatest trial ever, so won't He surely take care of the ones we face today? Hear Him say, Don't fear…I've got this.